Are You a Terrible Parent to Your Sponsor Child? We all feel like a terrible parent sometimes, right? I know I am not alone in this. Even when we we are on our game balancing the whole family dynamic, sometimes other relationships fall to the sidelines, or fall away all together. It is no wonder so many of us have felt guilty as sponsor parents to the kids whose pictures we’ve have tacked to our fridge, while in every other way they are out of sight and mind as they survive across the globe. The other week I wrote A Farewell Letter to My Sponsor Child while I processed what it was like to have one of the children on my fridge be removed from my life. Even though I found this hard, still, in so many ways Hippo wasn’t actually part of our lives in effort, thought or prayer. You see, we rarely gave her extra money. But when we did we were sent pictures of her new dress and the bags of rice her mom was able to feed her family with–they were so grateful. It was humbling. We didn’t write her often, just every few months. Most of the time this was just scribbled notes and pictures exchanged. I always wished she would smile in those pictures. We didn’t pray for her often, either. Sometimes, but barely ever. Her name usually only came up in conversations about poverty with my kids, or when we received a letter from her first. I might venture to say we weren’t that invested in her, and we weren’t great sponsor parents. Maybe we were a bad sponsor family. I also felt bad because I didn’t tell her about my beliefs. As we had to go through a special application to get a sponsor child in a violent and “closed” country, I knew going into it that for the program and her own safety, I would not be able to blatantly talk with her about everything. At the time, I thought that giving her a good start should be my primary concern, so that she could be healthy enough to survive and have a future. I hoped that experiencing love and provision might push her to seek out the motivation of why we did this when she grows up. But as Hippo can’t access the grace and hope I have via her cultural religion, this was a hard decision that sometimes I still feel tension and guilt over. What Is A Good Child Sponsor? For whatever reason is seems child sponsors often consider themselves bad at fulfilling their role. 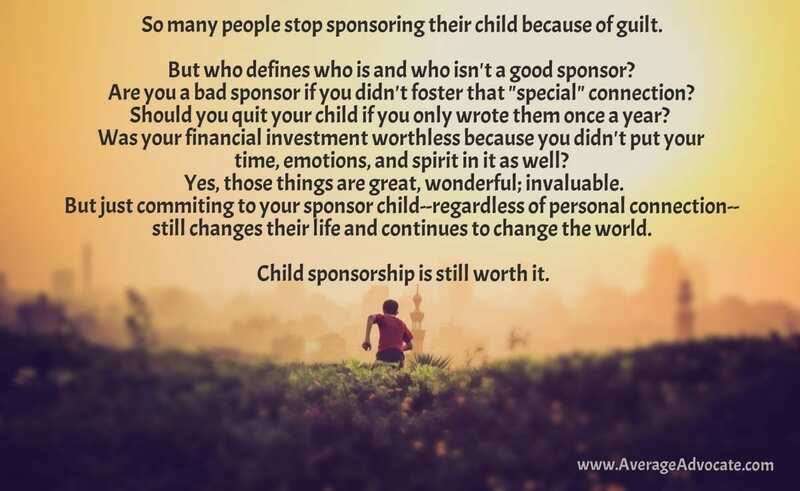 I have friends who’ve stopped sponsoring because they did nothing for their child–nothing except their monthly check, that is. I don’t believe that this response is uncommon, as guilt will weasel its way in to block even the best intentions. My question for you is, who defines who is and who isn’t a good sponsor? 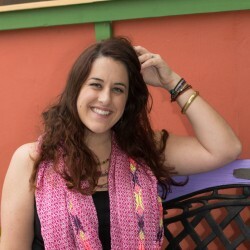 Are you a “bad sponsor” if you didn’t foster that “special” connection? Should you quit your child if you only wrote them once a year? Was your financial investment worthless because you didn’t put your time, emotions, and spirit in it as well? Yes, those things are great, wonderful; invaluable. But just committing to your sponsor child–regardless of personal connection–still changes their life and continues to change their world and the world. Child sponsorship is still worth it. Is Child Sponsorship Effective? Yes! Despite what type of sponsor I was, I have to appreciate I was part of making a difference. Hippo’s community has been served by a sponsorship program for the last fifteen years. It went from everyone having babies with no medical care, disease rampant, lack of access to sanitary sewage, children with no sense of worth or bestowed human rights (let alone education), and parents didn’t have the skills to take part in, let alone create a healthy economy. But that has all since changed in this region in Myanmar (you can watch this video about it here). What I’ve read on the effectiveness of sponsorship is astounding. Even if your sponsorship is just a check, that check turns into health care, education, vaccinations against prevalent diseases, protection from mosquito-borne illness, and added nutrition. Your check is the simple difference between perpetuating the cycle of poverty and freeing a human being to bring life to their society. Child sponsorship is a vision that has to be continually renewed within the sponsor. Otherwise we just stop caring and our own desires tend to trump our budget and float to the top of our priority list. So, I encourage you, if your money is already invested in a child, allow your heart to follow, paying attention to who you are financially investing in so you don’t lose that vision. For example, no matter how much the humanitarian agency tries to help this process to get us connected to our child, the ball is still in our court to respond to their prompts and reply. What we don’t want is for the purpose and value backing child sponsorship to be swept beneath layers of our guilt, our greed, and all the things demand our attention. But on the other hand, don’t condemn yourself for not meeting an imaginary standard, either! Sponsorship isn’t about writing letters, it is about creating a self-sufficient community. So let yourself loose a little. So often us do-gooders tend to be so caught up in being busy, whether by doing other “world changing things” or just struggling through life. Child sponsorship is a great place to really get into it and bless a child as there is room for that relationship to grow. In fact, you could spend all your money sponsoring all the children, and writing them all day, everyday. If that is you, that is awesome and amazing. But maybe that isn’t what your next step should be. So don’t push it. Wait until you aren’t trying to pull from an empty well before you try to invest more of your soul into your sponsored child. Even if you well is empty and you can’t do all the “extras,” try to be just content with being committed. Because in that, you are still changing their physical world and future. Sponsor a child (or more children)! Stop condemning yourself for being a “bad” sponsor parent. If you are challenged to be a more intentional sponsor, let me know what action you are committing to in order to live that intentionally out. Chose one way to create more margin in your life so you aren’t giving from an empty well. Pay attention to where your money is going so your heart can be invested as well as your finances. What is your next step? Be sure to let me know in the comments!